I was hoping that Patches and I could climb both Mt Liberty and Mt Flume on this trip, but I knew that this might not happen. I was still climbing more slowly than I had been before my heart valve surgery last September. There's nothing wrong with the new valves or with my heart function, and so far, there's no explanation for this effect. I may just have to live with this issue for the time being. 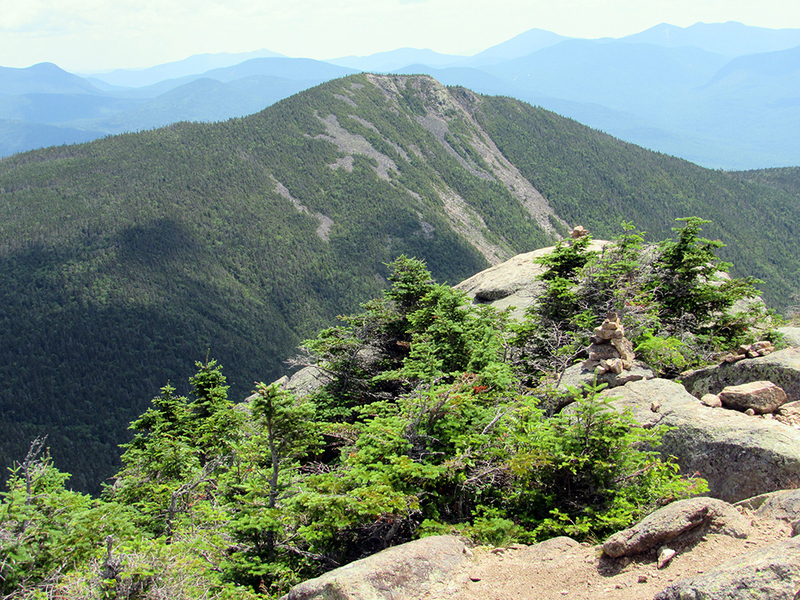 Going up the Liberty Spring Trail to Mt Liberty and then continuing on the Franconia Ridge Trail to Mt Flume has only two viable options for returning: go back the way we came, or descend via the Osseo and Lincoln Woods Trails. The first option would add a second climb up Mt Liberty, while the second involved a long hike down and the need to call a shuttle to get us back to the car. Going down the Flume Slide Trail was basically a non-option as it's not recommended for descent. 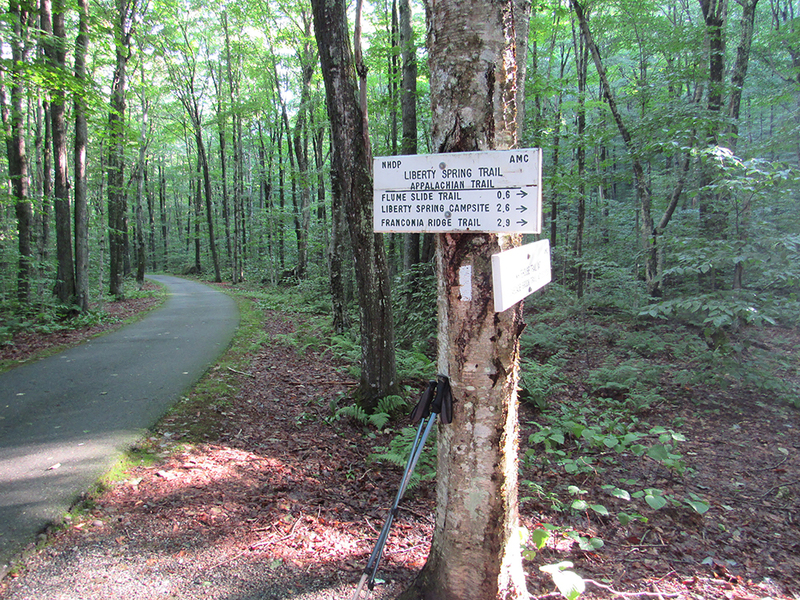 There is no parking at the Liberty Spring Trailhead, so we parked at the hiker's parking lot near the Flume Visitor Center and took the Whitehouse Trail to the Franconia Notch Recreational Trail (the bike path) and followed it to the Liberty Spring Trail. I was hoping to take the bike path all the way to the trailhead but the hiker's parking lot doesn't have direct access to the bike path and I didn't want to backtrack to the main Flume parking area. As usual, Patcbes was a very good climber unless someone was approaching from behind us. This causes her to lose her focus and spend a lot of time stopping and looking in back of us. 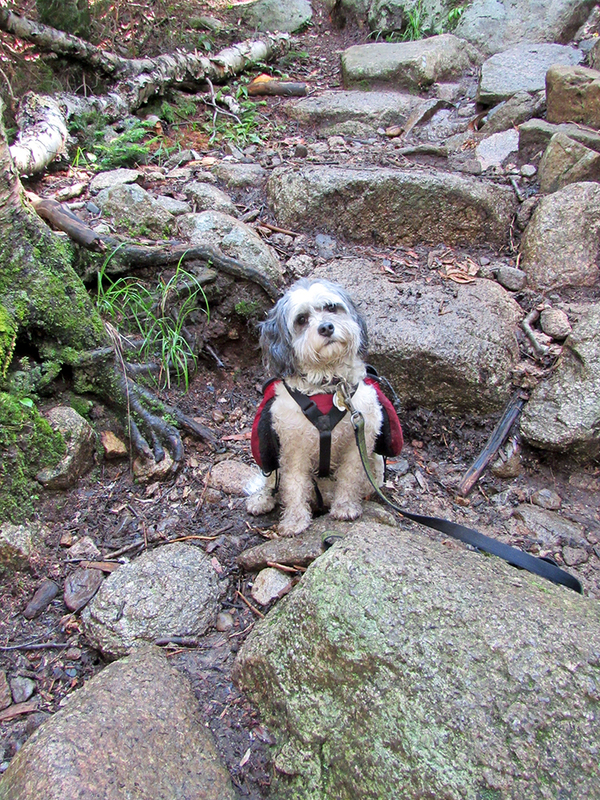 It's no fun, and also very tiring, to keep pulling on her leash just to get her continue going up the path. The only solution is to let the hiker(s) pass. This works well as long as the trail isn't so crowded than someone is passing us every few minutes as they were when we climbed Mts Lincoln and Lafayette on Columbus Day in 2015. Knowing that there was a good source of water at the Liberty Spring Campsite, I only brought one full bottle (a 32 oz insulated Hydro Flask) of water with plans to refill at the campsite. Extra weight slows me up even more. The water from the spring was nice and cold but a little tedious to filter while kneeling on the wet rocks. 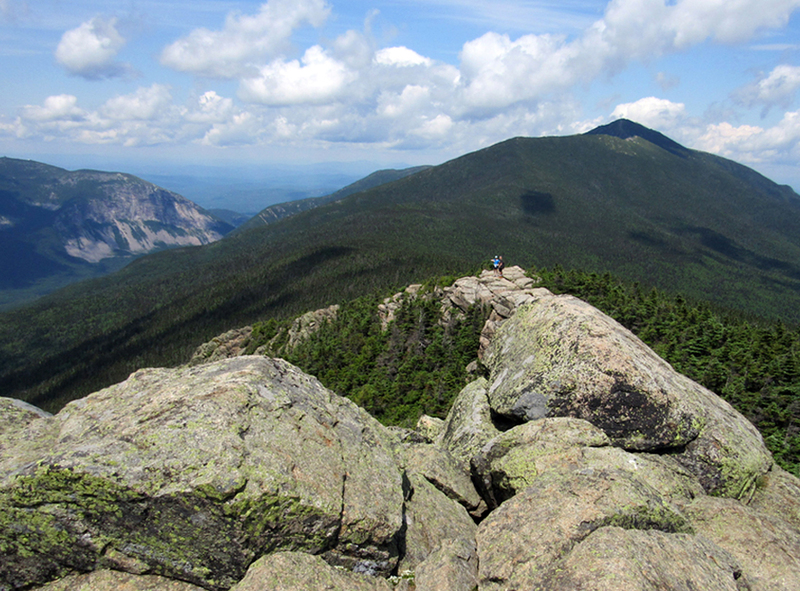 Beyond the campsite, it wasn't a whole lot further to the Franconia Ridge Trail, and from there up to Mt Liberty. 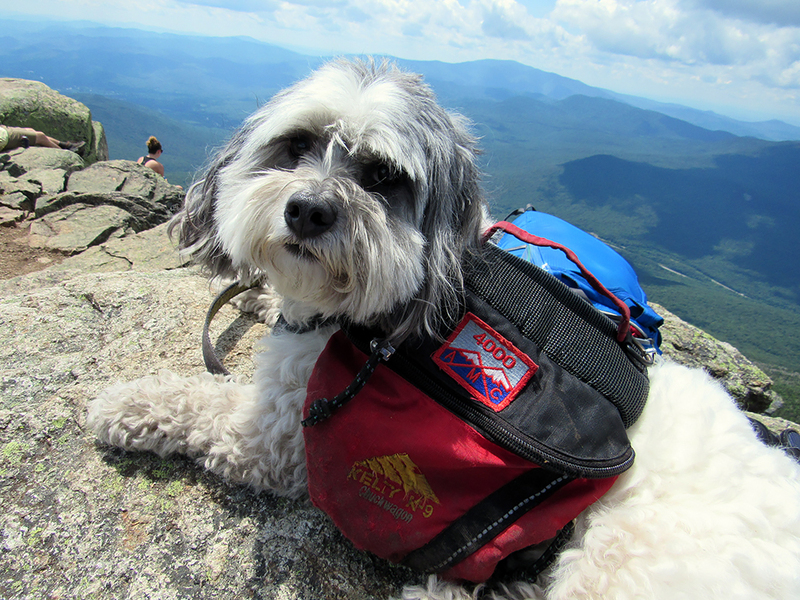 It felt great to finally emerge onto the bare summit rocks, and sit down for a nice rest and something to eat. Despite a few lazy cumulous clouds drifting by, the air was quite clear and the views were excellent in all directions. There were other hikers up on top, but it wasn't so crowded as to be unbearable. 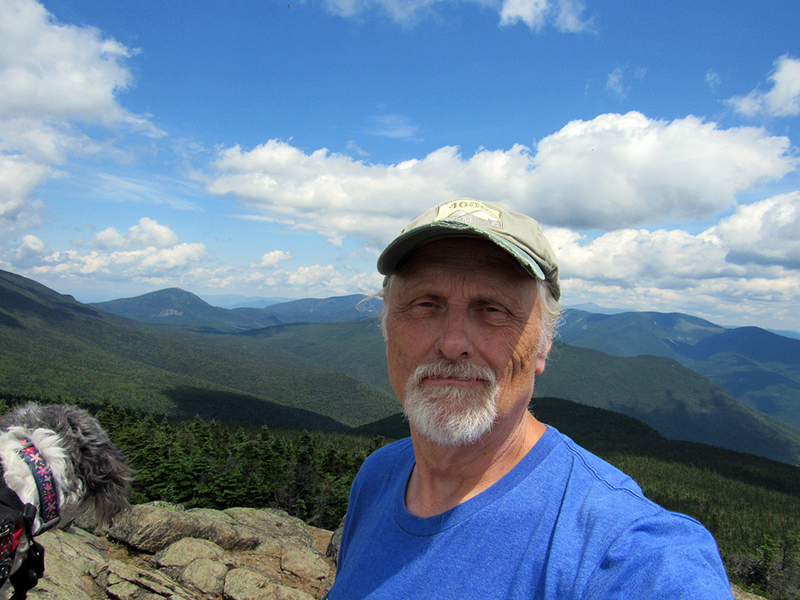 We sat on what seemed to be the highest (and reasonably flat) rock on the summit overlooking Franconia Notch from Cannon Mtn and Artist's Bluff to the north, to the Indian Head Resort and Loon Mtn to the south. I had already decided that we didn't have enough time and energy to continue on to Mt Flume this time, so there was no real reason to hurry back down. The sun was nice and warm and the air was just the right temperature for comfort. The Liberty Spring Trail is in pretty good shape, and not too rough, so we made pretty good time bounding back down over the rocks from step to step. Finally reaching the bottom, I decided that we'd take the bike path all the way back instead of the Whitehouse Trail. The bike path is smooth, level, and easier on your feet after a long hike, and one can travel much faster on it than on a rocky trail with numerous minor ups and downs and rough footing. In the end, although we hadn't made it to Flume, we did have a nice hike, and Patches checked off one more 4000-footer, which brought her total up to 22, just two short of the halfway mark. Liberty Spring Trailhead at the junction of the Franconia Notch bike path. Patches on the Liberty Spring Trail, somewhere bretween the Flume Slide Trail junction and the Liberty Spring Campsite. The Spring at the Liberty Spring Campsite. It's still good to filter your water. 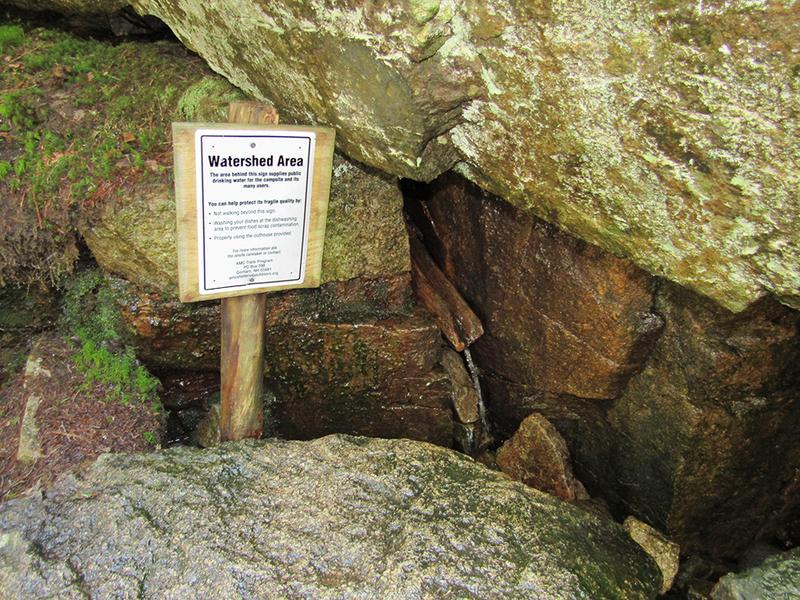 The sign gives tips on keeping the source of the water clean. 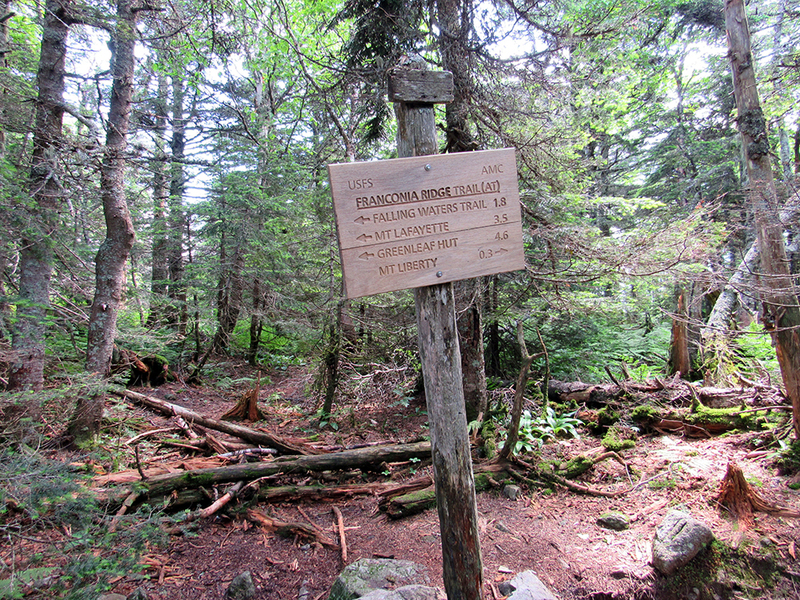 Franconia Ridge Trail junction. From here, the siummit of M Liberty is only a short distance away. 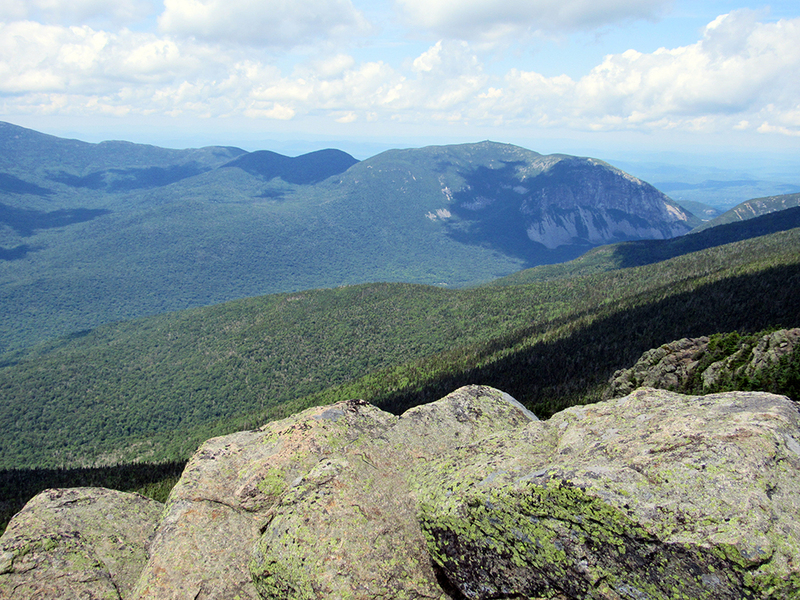 The slopes of Franconia Ridge with Cannon Mountain and its cliffs. To the left of Cannon, the small knobs are the Cannonballs. 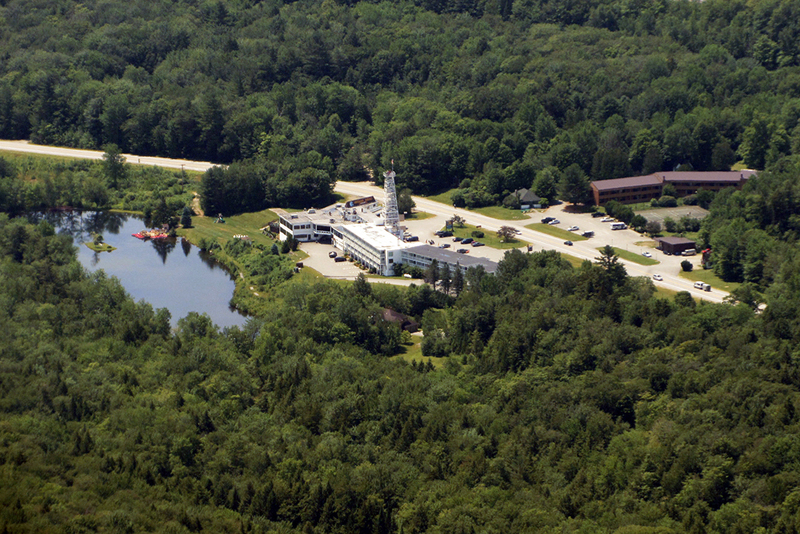 Closeup of the Indian Head Resort down in North Woodstock. 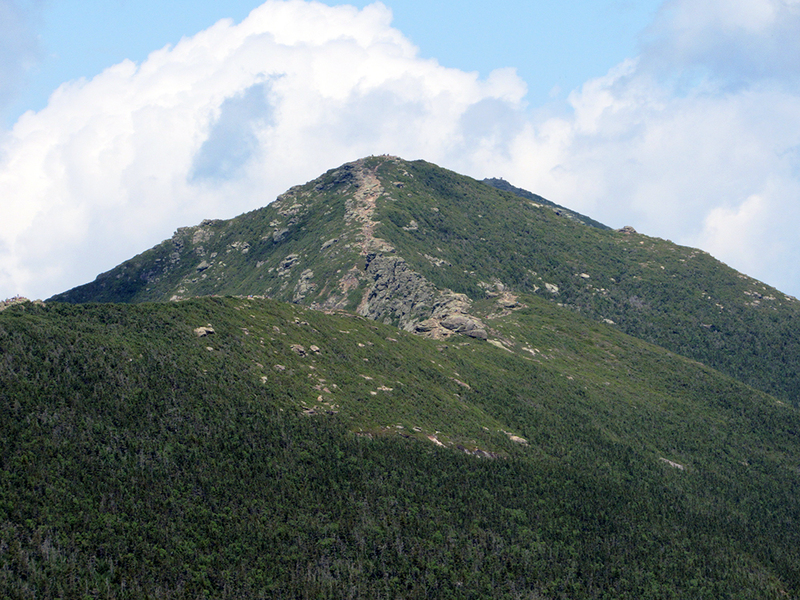 Closeup of the Franconia Ridge Trail winding its way up to the summit of Little Haystack. Hikers on their way up to the summit rocks of Mt Liberty. 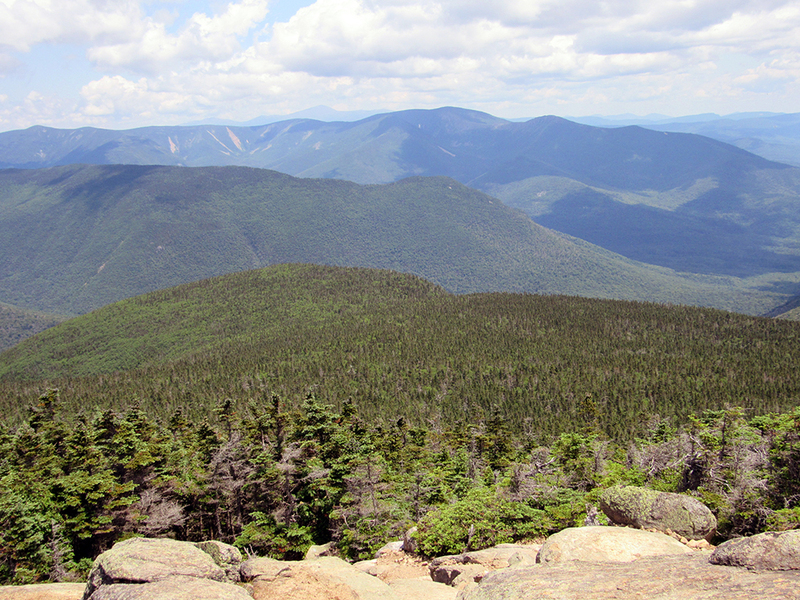 Northern panorama from Cannon Mtn on the left to the Twins and Bonds ranges on the right. 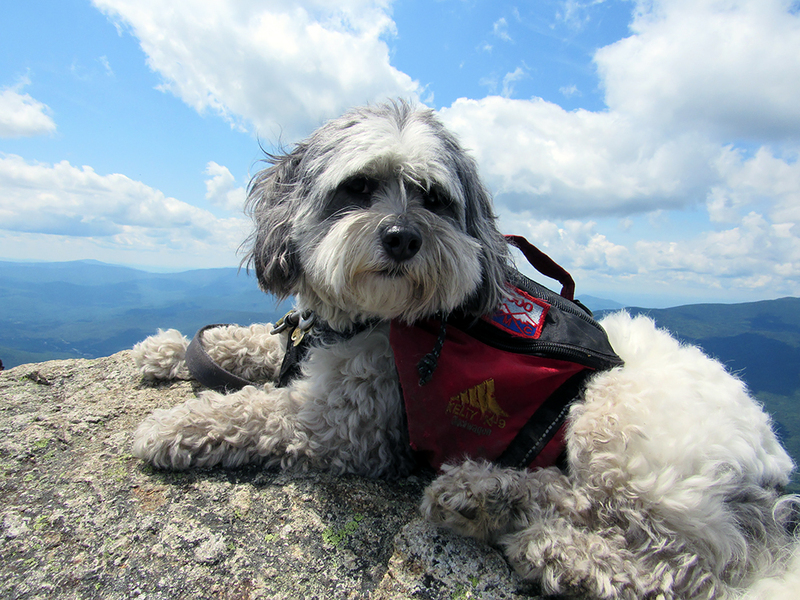 Two views of Patches resting on the Mt Liberty summit rocks. There were a number of other hikers up there at the time, but it wasn't as bad as when we climbed Mt Lincoln and Lafayette on Columbus Day in 2015. Self-portrait with Patches getting a glimpse of the view to the northeast. Owls Head and the Bonds from Mt Liberty. A hazy Mt Washington is also visible in the distance. Mt Flume from the summit of Mt Liberty. I was hoping to go there after Mt Liberty but we weren't making good time and the hike back to Liberty involves another long climb. 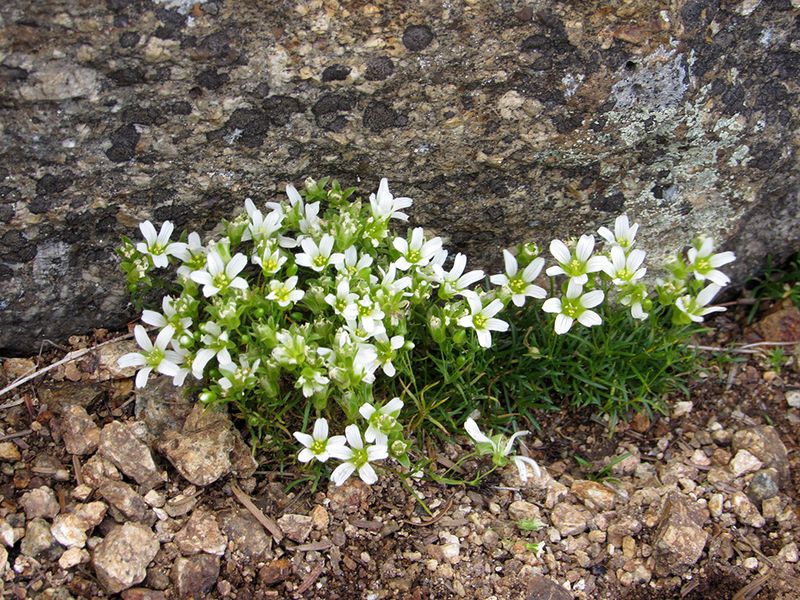 Mountain Sandwort growing amongst the rocks just below the summit of Mt Liberty.